Main site > Forums > Household & Travel > In my home (includes DIY) MoneySaving > Anyone know what this planning mark means? Anyone know what this planning mark means? Thanks to anyone that can explain! The marks are in line with each other (as in the one in the living room is directly below the one in the bedroom) so it can't be a skylight. and Surely not a loft hatch either...? Skylight / loft hatch ? I don't know what it means but just wanted to comment is that the rooms appear really really small? Maybe it's just me ? 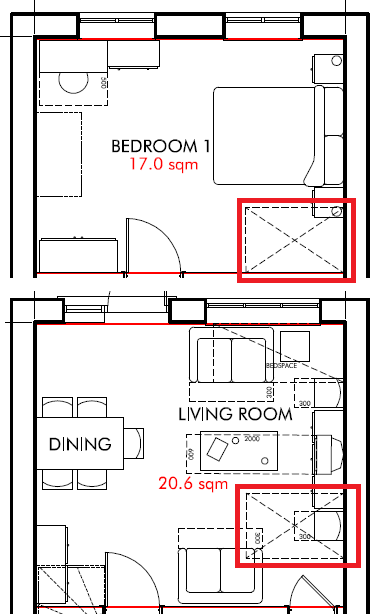 20.6 sq meters for a living room is 221 sq ft (I work in old money). The square root of 221 = a room 14'8" square, which is "pretty generous" by many new build standards. The 20.6 living room is 4.53m square. My living room is smaller. remember its also a dining room! It's a new build, poky rooms go with the territory. Maybe it is a loft hatch and the inclusion of it on the living room is an error? I can't think of anything other than a lift shaft(!) that would go through both rooms. I can't think of anything other than a lift shaft(!) that would go through both rooms. That's not such a daft suggestion, houses might now be designed with space for a lift and the floor joists laid out accordingly so one can be easily fitted later if needed. Unless I'm missing something where are the stairs ? Spot on. Quite a lot of new build developments comply with Lifetime Homes standards. One of these is that a through floor lift can be provided if it ever became necessary. So this is what the square is likely to be. Below is a link to the particular criteria. You can read the other 15 points your home will also comply with. Newuser1987 is correct - it's for a small through-floor lift and complies with Lifetime Home Standards. The lift won't be in place when you purchase the home, but it's the location/ space that is allowed for such a lift. Not all homes are able to accommodate a stairlift-type arrangement. I guess have to think carefully if you are happy with a potential lift in that specific space in case you ever needed it when you are old . Bathroom? Who needs one of them when there are perfectly good windows to open? I can't see the builder doing that.